Elder flowers, also called European elder, have a long history of use in traditional German medicine. They have antioxidant properties and an antiviral effect, which is why they're still popularly used to help fight off colds and flu. Elder flowers can be brewed as an herbal tea. Elder contains vitamin C, which is important for the health of your skin, blood vessels, tendons and ligaments. It also contains a flavonoid called quercetin, a powerful antioxidant. Its high antioxidant content makes elder flower tea beneficial for protecting your body from oxidative stress, which can lead to common chronic diseases, including heart disease, cancer and diabetes. A study published in the "Online Journal of Pharmacology and PharmacoKinetics" in 2009 found that elder flower extract is very effective in treating flu symptoms. Participants experiencing three or more flu symptoms were given four doses daily of elder flower extract at 175 milligrams, while others were given a placebo. After just two days, 28 percent of the elder flower group were no longer experiencing symptoms and 60 percent had significantly less severe symptoms, while the placebo group showed no improvements in symptom prevalence or severity. Despite these promising findings, the benefits of drinking elder flower tea have not been confirmed. A study published in the "European Journal of Clinical Nutrition" in 2004 found that elderberry juice lowered total cholesterol and triglyceride levels in young adults after two weeks of daily doses. Elder flowers themselves have not been studied for their effect on cholesterol, but they do contain quercetin, which was found to reduce cholesterol levels in test tube studies. More research is needed to determine whether drinking elder flower tea improves cholesterol levels. Regular consumption of elder flower tea has been found to be safe in the short term, but its long-term safety has not been determined. The berries of the elder plant are also used as medicine, but they are toxic when consumed raw. The bark, leaves and seeds of the elder plant are toxic and should be completely avoided. Elder flower may have a diuretic effect and enhance the effect of other diuretics, whether natural or pharmaceutical. Consult with your doctor if you're taking any medications, as they could interact with elder flowers. 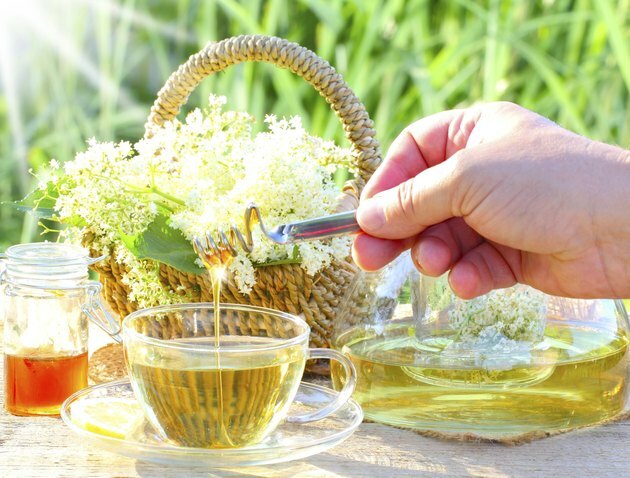 Avoid elder flower tea if you're pregnant or breast-feeding. Is Rosehip Herbal Tea Safe for Pregnancy?